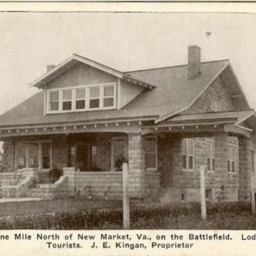 The Hill, One Mile North of New Market, Va.
Postcard showing "The Hill" located on the New Market Battlefield approximately one mile north of town. The house was used as lodging for tourists. 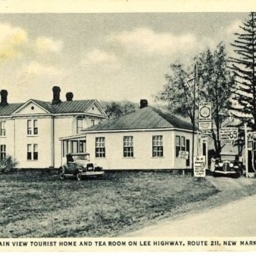 Postcard showing the Mountain View Tourist Home and Tea Room located on Lee Highway one miles east of New Market VA. 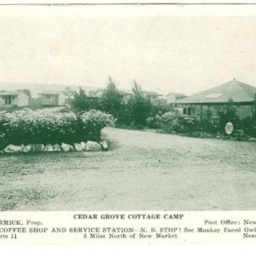 The site featured a free garage, cabins, and campground and was operated by Mrs. F.L. Bingham. 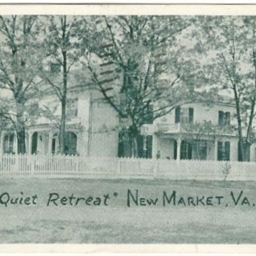 Postcard showing the Cedar Grove Cottage Camp located three miles north of New Market Virginia. The site featured a coffee shop and service station. It was operated by F.N. McCormick and advertised "Monkey Faced Owls." 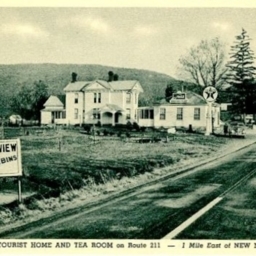 Postcard showing Bingham's Tourist Home and Tea Room located on Route 211 one mile east of New Market Virginia. The site boasted a free garage, cabins, and camp grounds. It was operated at the Mrs. F.L. Bingham.